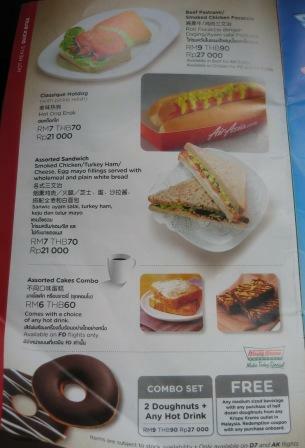 Update 2017: Air Asia no longer have this menu for quite sometime – their menus now are more simplified with very few selections. In a way it is also good to address the food wastage and reduce high operation cost of having ordered food that no one is buying. If you wish to have better selection of food, then you need to pre-order when you book your ticket. If you have not done so, you can login to your Air Asia account to add in your food selection at least if not mistaken 24 hours before your flight. Some food may be made available during in flight but you generally pay less during booking and it comes with free mineral water (small small one only). 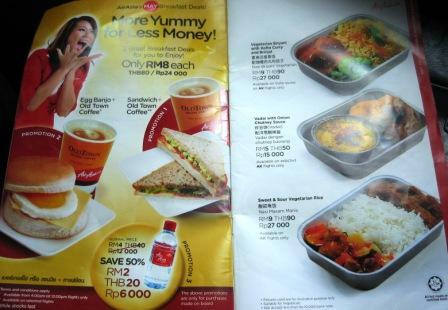 Important to know: Air Asia as it is a low cost airline does NOT provide free food or drinks. 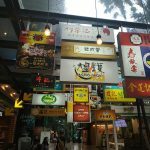 You need to buy the food either during the flight or when booking your ticket. Usually the day prior to my flight, I will usually buy some of my favorite breads from bakeries like Bakers Cottage for me to eat while waiting at the airport or on the plane. This is because I get to choose my favourite varieties, the bread are more fresh and much cheaper too (I could get my favorite tuna mayo for less than RM2 from the bakery but have to pay a few times more for something that does not even taste as nice). 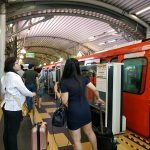 Recently when I flew to Chiang Mai, Air Asia had my flight to 7am (it’s supposed to be 10am when I booked it). 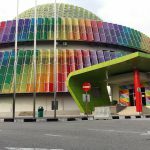 That means that I have to arrive LCCT by 5am- and please note that in that early hours, there is no buses yet- so you need to arrange your own transport there. Luckily I went to buy some bread and pack them in my hand carry luggage- in the airport, I was suddenly so hungry. Anyway, if you are a tourist visiting Malaysia and Thailand, you can still sample some local delights in the Air Asia plane itself. Once you reach your seat, take a look at the menu book attached in front of you. The menu is usually revised every few months. The one you see here is effective March 2010. 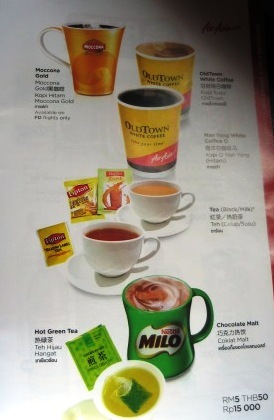 It’s good to see that they have included Old Town White Coffee in the menu- previously they use the usual Nescafe 3-in-1 (those in packs of green, red and yellow which not all people may fancy). 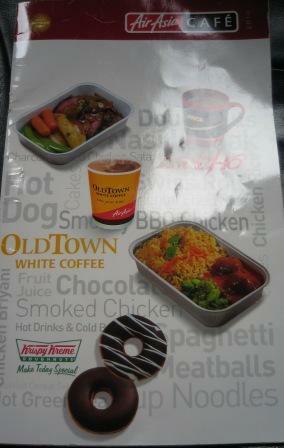 There’s even a combo set of 2 doughnuts and any hot drink- for RM9 (THB 90). There are other pages containing more food but I did not take the pictures here.